Lentil soup is not something that's ever excited me. I don't mind it -- I'll eat it -- but I associate it with a type of earnest, serious -- sort of dreary --1970s style of "health food." In my mind it keeps company with brown rice casseroles, and leaden cakes and pastries made with whole wheat flour and honey, eaten by serious and earnest Earth shoe-wearing people. I realize there are those who love lentil soup, and that my views on the lentil are no doubt due to my inability to appreciate the lentil rather than any shortcoming on its part. But there it is. I still don't find lentil soup exciting. Except for this lentil soup, which is the polar opposite of muddy brown lentil soup. It's a thick, rich yellow, brightened with cumin, lots of lemon, and red pepper. I'm not the sort of person who's given to using words like zingy but if I were, I'd call this soup zingy. It's the sort of soup that provides a good antidote to February which in Baltimore is cold, often grey, and given to ice storms. 1. Saute the garlic and onion over medium heat until the onion is tanslucent. Add the cumin and coriander, saute briefly, then add the lentils, chicken broth, and carrots. 2. Bring the soup to a boil then reduce to a simmer. Cook until the lentils are soft which will take about 30 to 45 minutes. 3. Stir in the cup of water, stirring to smooth the soup a little. Bring it back to a boil, remove from the heat, stir in the lemon juice. Taste for seasoning. I found that I needed no additional salt -- the canned broth provided enough. 4. Serve garnished with aleppo pepper and cilantro leaves. Pass lemon wedges for those who want to add additional lemon. A very geeky cookbook aside: this recipe for red lentil soup is based mainly on one for shorbet adds, an Egyptian soup, from A Beautiful Bowl of Soup. Last weekend as my soup simmered on the stove, a thought occurred to me and I pulled my copy of Aromas of Aleppo: The Legendary Cuisine of Syrian Jews off the shelf. Sure enough, there was a recipe for shurbat addes, described as a thick and hearty red lentil soup with garlic and coriander, it was flavored with aleppo pepper, cumin, cilantro, and lemon. Intrigued, I checked Jewish Food: The World at Table and found a similar recipe for shorba addes or sour red lentil soup. In Sephardic Flavors: Jewish Cooking of the Mediterranean I found a recipe for sopa de lentejas colorada another red lentil soup flavored with cumin, cayenne, and lemon juice or vinegar. It's a red lentil soup that gets around. I´ve always thought lentils pretty boring, too. Here they´re a staple, grandmother stuff rather than hippy, but still, boring. Now I´m a convert, though, and the red ones, so pretty, make me even happier. The soup looks very zingy, you´re right. You're just showing off about your insane cookbook collection. A bowl full of sunshine! I do love the zing you've put in this one. But I love all lentil soups. Dinner last night was lentil stew. I have never had lentil soup - the only way I have tried lentils is cooked like beans and eaten with rice. I'll try this recipe once the winter comes, sweetie - I'm bookmarking it now! I always forget about the red lentils in my pantry when I make lentil soup (I am one of those people who loves the muddy brown, thick traditional lentil soup). Your bowl definitely does look zingy! Try red lentils, diced potatoes, and regular head cabbage with chicken broth. Sweet and creamy. I made this soup to use up some vegetables and was surprised by the wonderful result. The potatoes and lentils melt into each other. I'm right there with you on brown rice and leaden loaves, but lentil soup can be hearty [in a good way], lively and... [well, if I said "zingy" I'd say it here]. 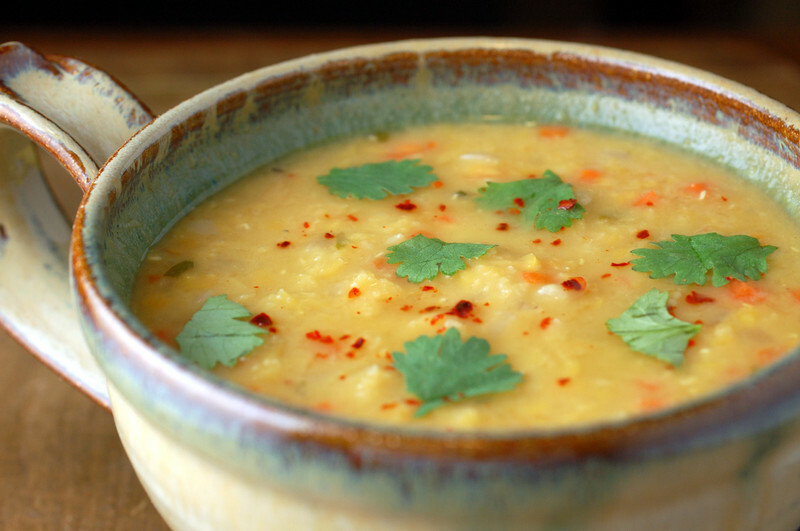 Here's a flavorful, spicy curried lentil soup that I bet could win you over. So... just how many cookbooks do you have anyway? yup lentils. blech...so instead of zingy...how about sassy? I love lentils when done correctly. This soup looks delicious! I love lentil soup of all kinds, but this one in particular looks really drool-worthy! This looks really delicious AND beautiful. i'm a fan of lentil soup, but i do prefer the red variety over the brown kind solely based on the color it produces. my go to recipe uses cumin, too, but i wanna try yours with the lemon juice. i'm sure it will be most tasty. it is indeed a beautiful bowl of soup! I hear you on bad lentil soups. I do actually like lentils, but I, too, have been the victim of too many earnestly drab lentil soups. Yours is quite pretty, and it sounds great. (if anything ever sounded depressingly virtuous) and it was excellent- who knew? Mudjaddarah got me over my anti-lentil prejudice some time ago, but I still remember a friend describing lentil soup as "tasting like dirt". No doubt there are some that do, but yours looks a beauty. man i love lentil soup. send some this way! I'm pretty fond of lentil soups in general, but they do need kind of a kick in the pants to get them going (there's a great Spanish/Portuguese one that I make with chorizo sausage and spinach, and another good Mid-Eastern one with garlic and mint). This one sounds just perfect for this time of year -- not too heavy, but nicely substantial, and zesty enough to put spring in your step. I'm with you on the lentils. But this soup sounds so good with the lemon and whatnot. I'm gonna give it a go.! Lobstersquad, I’m working on a conversion. I’m definitely converted as far as red lentil soup. Miz S, insane!? OK, maybe a little. Ann, ancient hippy food, heh! You’re so right about tofu keeping company with the bad 70s food. I’d forgotten about tofu but I’ve never really warmed up to tofu and I think it’s because I’ve had bad experiences with it from that era. Adele, it really was a pretty soup. I’m always drawn to color but especially at this time of year. Sher, how come your siren call is lentil soups and mine always seems to be chocolate? Lydia, there’s a lot of you brown lentil soup lovers out there! Maybe one day I’ll come around. Zora, that sounds completely, completely delicious! Terry B, that’s the soup that might convert me. It looks wonderful. Meg, perhaps my issues with brown lentil soup all go back to having not had it done correctly. Certainly lots of other people love brown lentil soup. Ann, thanks! It is pretty, isn’t it? Lore, I think those colors are part of what draws me to it. Blueplate, I think the lemon added a great lively note to this soup. Meg, drab! Perfect description. Although clearly there are non-drab brown lentil soups out there and I am on the hunt for them now. Lindy, I have had mudjaddarah on my too-try list for forever, mostly based on your enthusiasm for it. Emma, I would if I could! Julie, those both sound excellent. I’m hoping that the recipes are in your archives. I saw this book at the bookstore the other day! Thanks for posting this recipe and I will definitely try this soup! Thanks for the reminder on this book too and maybe I'll have to go back and get it! I haven't made red lentil soup since I posted on it last fall. Thanks for the comforting and delicious reminder. I'll be making one next week. LOVE lentils and your blog!! I'll definitely be trying some of your recipes and keep you posted on what I think! and this soup sounds really wonderful. i've not done a red lentil soup for awhile. this recipe is a total keeper. I just made red lentil soup last night...so simple but tasty! Lentils CAN be so dreary in soup. I've always much preferred a good Indian dal, and this looks like a brothy version of that. Will have to give it a go! thanks for the recipe! looks delicious! I read an article that said that the lemon juice increased gastrointestinal problems that is true? not like to see me hit me in the future!! Although humans have mechanisms that can offset the effects of appropriate combinations of food, always good to take advantage offered by scientific advances and studies which lead us to a diet much more sophisticated and much better for body. Another lovely blog. I love your photos and recipes - it's so inspiring. Ow, thank God I found this recipe! I've been searching for soup recipes so I can include it in my meal plan for this coming week. I avoid eating much solid foods because my dentist in Miami, FL extracted my tooth. Maybe on 1st week of April my mouth is totally healed.